Author of the book "Vaccination - A Business based on Fear" he now presents his latest book "The Decline of Tuberculosis in spite of 'protective' vaccination". It deals with the illness formerly known as "consumption", now better known as tuberculosis or TB. Here we learn about its history, its victims, the errors made by researchers, the failure of tuberculin and the BCG-vaccine and also about the Legislation for the Protection against Infections of 1.1.2001 and the scare tactics aimed at pupils and parents to promote vaccinations. We experience medical history: We learn about the belief in the healing power of the "King's touch" and the kissing of sacred objects, about the efforts and the mistakes of men like Koch, Pasteur, Ehrlich, Dettweiler, Rontgen, Brehmer. We relive the era of sanatoriums, Rontgen's discovery of X-rays and the implementation of various treatment methods such as restcure, surgical operations and chemotherapy. The famous "Koch's lymph" (later known as tuberculin) which was touted as a miracle cure for tuberculosis brought Koch international fame and the Great Cross of the "Rothe Adler Orden" (Order of the Red Eagle); speculators anticipating great financial returns invested their money in the construction of sanatoriums which sprung up everywhere. But already in 1893 the pendulum swung the other way: Koch's magic remedy caused any tuberculous infections to flare up and many of the patients died following treatment with tuberculin. Many of the hastily erected sanatoriums were closed and the speculators lost their money. Dr. Buchwald also describes the largest vaccine trial ever carried out: from 1968-1971 the World Health Organisation carried out a large field trial to test the BCG-vaccine. It was a test model to eradicate tuberculosis on this planet (while reaping a few companies multi-billion dollar profits). In one area comprising 309 villages about 364,000 people were vaccinated against TB while another area of roughly the same size was left unvaccinated. The results however caused great consternation among vaccination experts: in the vaccinated area there were more cases of TB than in unvaccinated area. In Germany it took the STIKO (Permanent Vaccination Commission) 27 years to acknowledge the field trial and to remove the BCG-vaccine from the list of "recommended" vaccines. In Germany deaths from tuberculosis declined from 117,596 deaths in 1901 to 630 in 1999. The findings of the field trial show that the decline cannot have been the result of vaccination. What was the real cause of the decline? The answer to this question is presented by Dr. Buchwald in this book. "In the publications of the pharmaceutical industry the blessings of vaccinations in general are being praised with prayer-like repetition....to instil the belief in the benefit and the necessity of vaccinations....Evidence which disproves such claims is conveniently ignored." 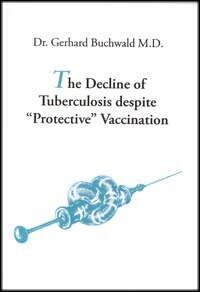 --Dr Buchwald (The Decline of Tuberculosis despite "Protective" Vaccination by Dr. Gerhard Buchwald M.D. p134.